Early in 2009 I was commissioned by the parents of two children who had attended Micklefield School in Reigate, Surrey. Their children had such a fantastic time at the school since the nursery and now both had moved on to secondary school. The parents wanted to give a gift to the school by way of saying thank you. 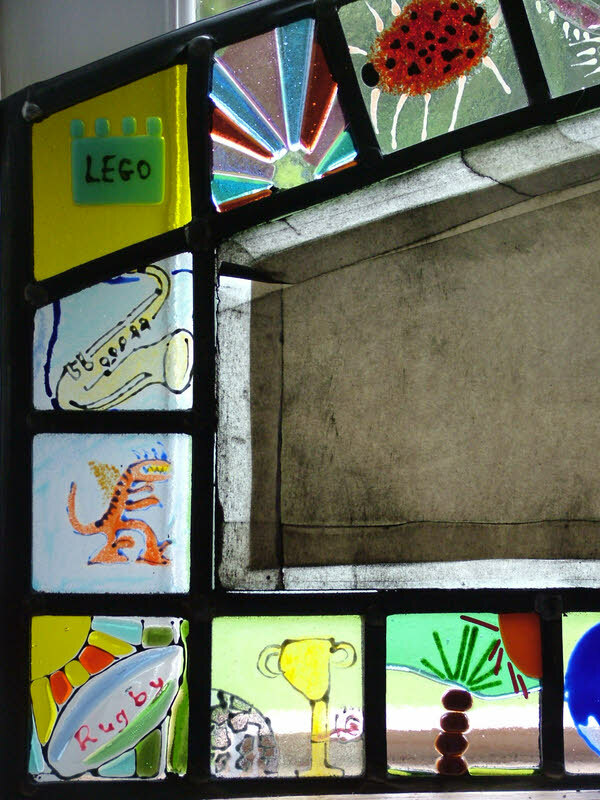 A transom panel on school building called Belton House, (after a previous head teacher), was the perfect place for a stained glass panel with a difference. All the school children were encouraged to draw a picture inspired by their time at school. The best 40 were picked and we made them using the same fusing techniques as we did on the St Martins School window. Little pictures fused and fired surround the acid etched name of the building. A small gathering to open the window was arranged and the children sang their school song for us all. Lovely!